Fiducials are markers (sometimes called fiducial markers) that are used for alignment. 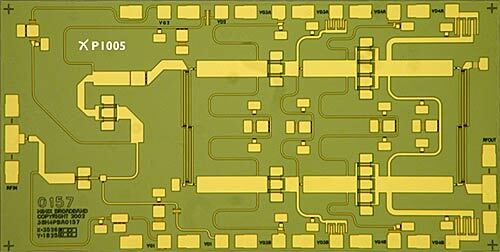 They can align mask layers on a PWB, MMIC or RFIC. They are also used to align auto pick-and-place assembly equipment so that it knows where to place components. One fiducial is not enough on a PWB. Just aligning to a single point will leave room for rotational error. It is best to place fiducial alignment at opposite corners of a large mask. The video below shows a small pick-and place machine. Around one minute and twenty seconds into the video, the camera looks for the fiducials on the corners of the PWB before it gets busy. Machines like this have removed a million assemblers from the world-wide labor pool. While we gather our own content on this topic, there is an excellent explanation on mems-exchange.org. There are many patterns used for fiducials. One popular marker is the chevron. Chevrons are inverted vee structures. The origin of the word is debatable, but note that it means "rafter" in French. Rafters are the beams that hold up a peaked roof (which form an inverted vee). A good source of non-copyrighted images is USPTO. Below is an image of a chevron alignment marker from 1992, assigned to Oki. Note that a chevron is almost always accompanied with stripes parallel to the "rafters"
Fiducials are sometimes (perhaps rarely) used on MMICs. 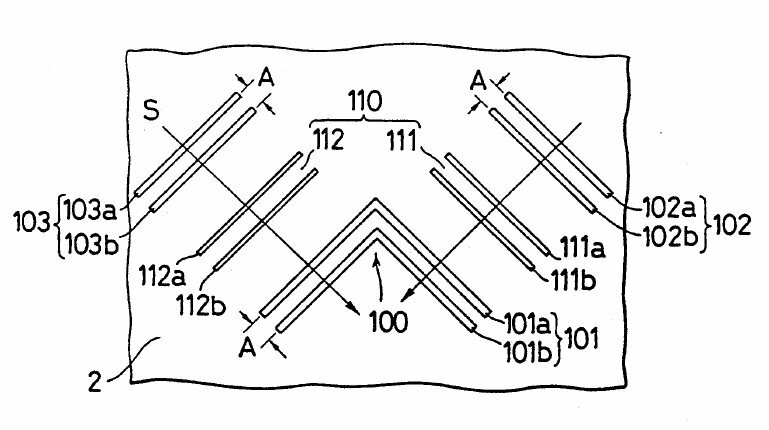 The image below of a M/A-COM amplifier shows four crosses in the corners which could be used during pick-and-place. However, machine vision can easily be taught to pick out other features on a MMIC, such as the RF bond pads, to use for alignment.